This is an interesting book in many ways. First of all, it has been banned from some school libraries due to its controversial topics. I can't turn down the opportunity to read a controversial book. Second, it is written for a young audience crowd that could be as young as seven, but it is written in a way that it can be enjoyed by readers of every age. As you are reading, you can sense some of it is simplified for a younger audience, but it doesn’t lose the meaning behind it, and it doesn’t seem elementary. There are a lot of sexual references as well as profanity. Third, it is actually based on the experiences of the author. Most of the tragic incidents are true, but according to the interview at the end of the book, a lot of the book is fictional as well. 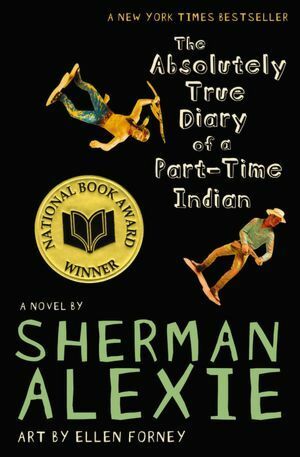 It was neat to see how Alexie could separate himself from Junior to make it into a fictional book. Junior is a young Indian boy living on a reservation. He doesn’t look exactly like the rest of the people around him. He had a few birth defects that made his head large and his eyes uneven. He is picked on all the time, and gets called names and beat up just for being himself. Dealing with alcoholic parents, a best friend with anger issues, and the every day trials of living on the reservation, he decides that he needs a change. He makes a brave decision one day that he wants to go to school outside of the reservation. The school he wants to go to has a predominately white population. He knows that it will not be an easy transition, and he is most likely going to be picked on. But, he would receive that same treatment if he stayed at his current school. The book then transitioned into a story of an outcast Indian boy dealing with living in a world full of racism while trying to make a name for himself. I really liked how Alexie was able to tackle really rough topics but present it in a way that wasn’t outright depressing. This book touches on alcoholism, bullying, poverty, homosexuality, and violence. I think this would be a good book for younger audiences. It can introduce them to tough subjects, and could spark questions and discussions on the issues.